Cortisone, hyaluronic acid (viscosupplementation), and platelet-rich plasma (PRP) injections are a recognized, effective, and safe treatment for joint, tendon, and ligament damage. Almost all joints are treatable. All your requests will be reviewed by Dr. Gaumont for optimal preparation, and access to this service is fast. The accuracy of ultrasound-guided infiltration is nearly 100% for most sites. Its advantage over anatomically benchmarked injections has been proven in numerous publications and is now standard treatment. Ultrasound-guided infiltration is used to treat all types of joint, tendon, and ligament disorders and is recommended for patients who are intolerant to, or cannot be prescribed, oral medications. In some cases, this treatment can help avoid surgery. Please note that you do not need a medical referral from a doctor to book an appointment with Dr. Gaumont. Dr. Gaumont graduated from McGill University Family Medicine from the Canadian College of Family Physicians of Canada in 1999, then as a specialist in Emergency Medicine from the Royal College of Physicians and Surgeons of Canada in 2002. Dr. Gaumont has practiced as an emergency physician for 13 years, the last six of which at Cité-de-la-Santé in Laval. In addition to specialized training in acute health problems, Dr. Gaumont is trained in ultrasound-guided infiltration. Knowing exactly where the injection is located is now the standard. Diagnosis and specific treatment are therefore carried out by the same person. PRP is Platelet-Rich Plasma and is collected through a blood sample. The sample is centrifuged to eliminate as many cellular components as possible and only bioactive molecules specific to the inflammation and repair process are retained. PRP is a natural, non-synthetic therapy. It has been used for more than 20 years to treat skin and bone pathologies, and for more than a decade to treat tendon, ligament, and joint injuries. The three main phases of healing are inflammation, repair, and remodeling. When a tendon, ligament, or joint is injured by acute trauma or chronic overuse, inflammation occurs. Inflammation not only serves to remove dead tissue from the injured site but also attracts the cells responsible for repairing the wound by a new collagen deposition and the presence of growth factors, among others. A flawed inflammatory process can lead to poor repair and prevent an injury from progressing toward an adequate, stable, painless final remodeling. The role of PRP is to boost this process to optimize healing. PRP is indicated for adults of all ages, whether athletic or inactive. Those for whom other therapies have been unsuccessful. Those who cannot take oral medications. Those who do not want cortisone treatment, those for whom cortisone treatments were unsuccessful or who experienced negative side effects, and those with a cortisone intolerance. Those who wish to avoid or postpone surgery. Your first appointment will be used to determine whether you are a candidate for this treatment and to discuss both expected success rates and potential side effects. 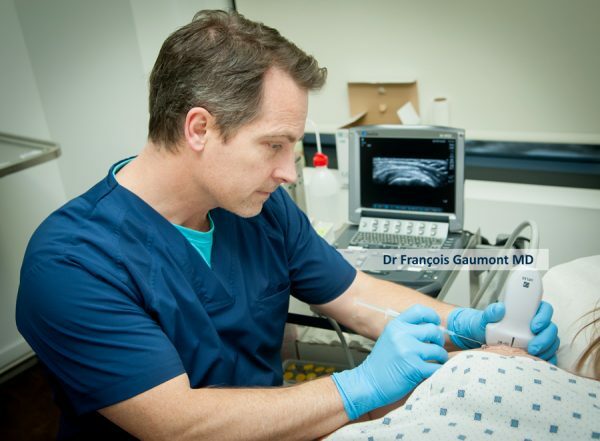 Contact us now to meet with Dr. Gaumont, specialist doctor in ultrasound-guided infiltration.